Tomorrow marks the first day of Spring. A time to open the windows to warm breezes and shake off the sluggishness of long winter months. Shake up your home and spring into action by evaluating your bathroom. Have you lived with a wobbly, shaky toilet for the past several months? Has your water bill been climbing? Have you handled one-too-many toilet overflow situations during the winter months? If any of these situations sound familiar, then it’s time to invest in a new toilet. At Mansfield Plumbing, we offer a variety of top quality toilets, in different sizes, styles and designs to fit your needs. Choose from our dependable Summit collection with PuraClean glaze finishes, our Alto or QuantumOne toilets, or our revolutionary Denali and Protector toilets. For single flush confidence, Denali features superior flushing performance that’s more than 20 percent greater than the highest MaP rating. Denali moves 1,200 grams of waste with 1.6 Gpf (grams per flush), as proven through independent testing. Denali maximizes energy by having water sit higher in its tank. During the flushing process, energy picks up as water moves through a three-inch flush valve to reach its highest velocity earlier in the flushing cycle. Dual side jets intensify the efficient and effective waste removal process. Additionally, Denali has been tested to one-and-a-half times the industry standard for carrying waste further down the drain line — up to a 60-foot drain line carry distance. To eliminate overflow messes, Protector features a unique concealed secondary drain. The Protector redirects overflowing water into the second drain, so messes are eliminated. 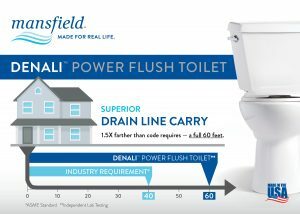 Head to www.mansfieldplumbing.com to spring into action and find your new toilet!